According to the polls, Americans favor root canal surgery over Congress. Cockroaches are more popular than our elected federal legislators. Even the sporting world’s most reviled creature – the replacement referees of the NFL – have more “likes” than the denizens of Capitol Hill. Our national revulsion for Congress is bipartisan. Republicans and Democrats have equal distrust for the legislative branch, no matter who is running the show. This disdain stems from anger at intrusive Congressional action and feckless Congressional inaction. It also stems from the fact that Congress seems utterly detached from the rest of the nation, or even the planet. The two Congressional leadership options, proffered by the major parties, are John Boehner and Nancy Pelosi. Both are longtime political hacks, constantly clawing their way to power and then doing almost nothing to rekindle America’s faith, trust and veneration of our national legislature. Pelosi’s policy agenda is even more radical than President Obama’s, and she has spent years wetting her beak at the trough of perquisites, including imbibing on friends and family stock options of companies she has regulated. But, in other ways current House Speaker Boehner is even more disappointing. The job of Speaker has to include setting a competent, moral tone for the Congress in particular, and the government in general. It’s a hard gig, since Americans correctly view their government as neither competent nor moral. A strong Speaker should have a sapient staff and that staff should keep close contact with committee chairmen and other leaders in the House of Representatives to ensure an effective legislative operation. When storm clouds start to form, sagacious leaders deal with them before things get out of hand. That’s their job. So, other than just declaring these folks the dumbest bunch of knuckleheads on the planet, it’s hard to explain the events that have come to light in the past week. 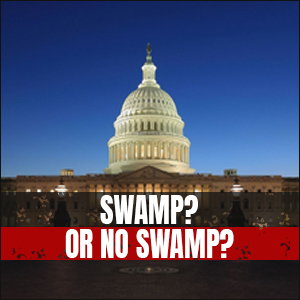 As revealed by the National Journal, the House Ethics Committee, behind closed doors, significantly limited the requirement of Congressmen to disclose travel paid for by private parties, such as lobbyists. Once revealed, these statesmen incredibly defended the move as part of their effort to streamline government. That bizarre explanation was met with national calumny, so today, the Chairman of the Ethics Committee, Representative Mike Conaway, announced they would reverse course again and restore the disclosure requirement. Is all well again on Capitol Hill? Not quite. This incident dramatizes vividly that the current leadership of the Republican Party is not merely incompetent, but also unlikely to lead the nation back to sanity, as we struggle to survive the remaining years under the worst president since Millard Fillmore. That the Ethics Committee was able to limit the disclosure of lobbyist-sponsored travel without setting off alarm bells in the Capitol pretty much says it all. That they were further able to defend this by claiming it was part of a government efficiency program is stunning. At what point was the Speaker planning on ripping the microphone out of the hands of these political wizards? Finally, after Ms. Pelosi, who has had more than her share of Congressional vacations, announced she would reverse this policy were the American people silly enough to land her back in the Speaker’s chair, the Ethics Committee reversed course. Now, instead of pounding the Democrats over a myriad of failures, ranging from the economy to Obamacare to foreign policy, the Republicans have allowed the Democrats to shift the discussion to Congressional travel and corruption. It’s laughable, of course, because the Republicans at their worst are infinitely less corrupt than the Democrats, but the Democrats know something the Republicans can’t figure out: how to hit America’s hot buttons. And Congressional travel is a great hot button. There is a Secret War happening right now… The target? Your privacy! When I was a lobbyist in Washington, DC, I knew that, in order to serve my clients’ interests well, I had to have meaningful access to the decision makers in Congress. It’s Lobbying 101: find out who is making the decision and get close to them. In those days, few things enabled lobbyists to develop strong personal ties to members of Congress more than taking a trip together. On a Congressional junket, paid for by a private party, you have tens of hours of exclusive time with a Congressmen. You develop friendships over rounds of golf in exotic locales. I used to take Congressmen to play golf in Scotland, Asia and even Russia! Lobbyists use these trips to lavish bounty on Congressmen, far from prying eyes. When they return home, the lobbyist and Congressman are BFF’s and the lobbyist has a new champion for all his clients. The only downside for the Congressman was if their junket became public. Few constituents celebrate the oligarch lifestyle of the rich and famous Congressman, supported by our hard earned tax dollars. Defending Congressional travel to your constituents is very hard. Just ask Eric Cantor. The reform legislation passed in the wake of the scandal that bore my name was supposed to severely limit lobbyist-sponsored travel. They created well-intentioned rules – which most mendacious lobbyists have found a way to ignore legally. One of the centerpieces of the reform bill was disclosure. At least, the American people would readily know which special interest was flying which Congressman where. The House Ethics Committee decided to limit this disclosure. They did it behind closed doors, like they were acting out a scene in Mr. Smith Goes To Washington – only they weren’t playing the Jimmy Stewart part. Once the public got wind of their move, they intoned that they were just trying to streamline government. Americans have cried for decades that our federal government is overly powerful and bloated, that there are too many duplicative and unnecessary laws. So, with thousands of redundancies in every sector of government, the Congress decides that their stand against government waste will be to eliminate reporting about lobbyist-sponsored Congressional travel? Is it really a mystery why we prefer root canal and cockroaches over these guys?